As the weather continues to cool down, some people may choose to head south for their holiday celebrations. If this applies to you, take an example from Brad Pitt’s Florida suit in the Ocean’s Eleven remake. Happy 49th birthday, Mr. Pitt. Brad Pitt as “Rusty” Ryan in Ocean’s Eleven (2001). Disclaimer: Reading the tips on this article will not make you look like Brad Pitt, nor will women treat you like you are Brad Pitt. 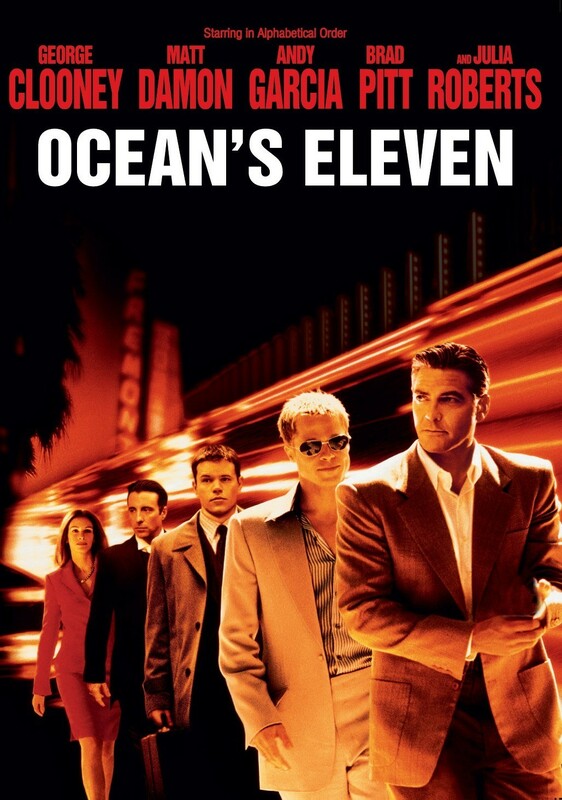 However, it may give you a few steps in the right direction when emulating the great style that defined Ocean’s Eleven. About forty years after the Rat Pack starred in the original, director Steven Soderbergh threw together a cast of Hollywood A-listers and remade Ocean’s Eleven with updates including the use of technology and the use of having an actual plot. Pitt clearly plays the second-in-command role to George Clooney’s Danny Ocean (Sinatra in the 1960 version). There is no direct parallel to this character in the original, so he could easily be described as a mishmash between Dean Martin’s cool Sam Harmon and Peter Lawford’s level-headed lieutenant Jimmy Foster. The jacket is double-breasted and fits very well, with darts on the front and a single darted back. The six buttons are standard for a double-breasted coat, as are the peak lapels. The ventless jacket’s additional details are 4-button cuffs, an open breast pocket, and jetted hip pockets. The pants, though not clearly seen, are naturally the same deep cream color. A sharp crease runs down the front center. On his feet, Rusty wears distinctive light brown leather shoes that he wears a variation of throughout the series. 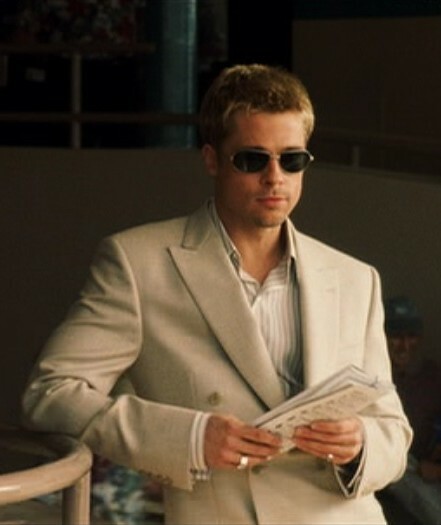 Anto Beverly Hills, which made all of Brad Pitt’s shirts for Ocean’s Eleven, confirmed that this beige herringbone striped silk shirt features the same consistent 1.5″ high collar band and 3.5″-long collar points as his other shirts on screen. It has double French cuffs that Pitt wears flat and unfastened for a rakish look best displayed when he’s seen drinking at the bar with Danny. As usual, Brad Pitt accessorizes plenty but with strong, simple items. His sunglasses are steel-framed Oliver Peoples with dark lenses. He wears a thick silver ring on his right ring finger and a lighter silver ring on his left pinky. A variety of tribal tattoos decorate his arms. Your girlfriend just swooned. Twice. Rusty’s most obvious asset is his cool factor. Where Danny, the group’s leader, is often guided by emotion, Rusty chimes in with a cool head. His bantering relationship with Danny is also essential, with each playing the yin to the other’s yang. However, the #1 most essential factor of Brad Pitt’s characters is their eating habits. Brad Pitt loves to eat. Directors love to show Brad Pitt eating. Perhaps this is due to the incredible phenomenon that, although he can make every woman’s heart melt just by giving the screen a briefly crooked smile, his expression while enjoying any food resembles the face one would make when smelling Andy Rooney’s old used diaper in the dumpster of a Chinese restaurant that has been closed down for ten years. In this case, Rusty enjoys some ice cream while at the track. Given his expression, it is probably also safe to suggest that Carl Reiner farted during the scene and Pitt was too courteous to tell him. Trust me, this is one of the tamer faces Brad makes while enjoying his on-screen food. Rusty’s signature drink during the films appears to be a vodka martini. Unlike James Bond’s preferred variation, Rusty is often seen drinking his martinis on the rocks (not in this scene, however), likely due to spending so much time in warm climates such as Las Vegas, southern California, and Florida race tracks. He tops it off with an olive. Pitt’s greatest moment in this sequence comes from his banter with Clooney. In this case, it is his silence that speaks the proverbial volumes. Danny: Ten ought to do it, don’t you think? Danny: You think we need one more? Danny: You think we need one more. Danny: All right, we’ll get one more. Guys like us don’t change, Saul. We either stay sharp or we get sloppy, we don’t change.